Inter Zonal District Level Football Tournament, organized by the Department of Youth Services and Sports under the scheme ‘Let’s Play’ co-branded with Khelo India Programme concluded today at Kathua sports stadium.Minister for Forests, Environment and Ecology, Ch Lal Singh was the chief guest on the occasion.Speaking on the occasion, the Minister threw light on the significance of sports and advised the players to play the game in true sportsman spirit. Playing sports inculcates team spirit and develops strategic thinking, analytical thinking, leadership skills, goal setting and risk taking, he added. A fit and healthy individual leads to an equally healthy society and strong nation, Lal Singh asserted.Highlighting the importance of Khelo India programme, the Minister said that it is Government of India`s initiative to revive sports culture in India at the grass-root level by building a strong framework for all sports played in our country and establish India as a great sporting nation.DYSSO Kathua, Subhash Chander Bharadwaj, informed that 18 teams from 12 zones of Kathua district in Boys and Girls category participated in this tournament and 6 winner teams from each zone were invited to play the district level matches which began on 9th April.Meanwhile, zone Sallan emerged as winner of Under 19 football trophies in boys and girls section whose final matches were played today. 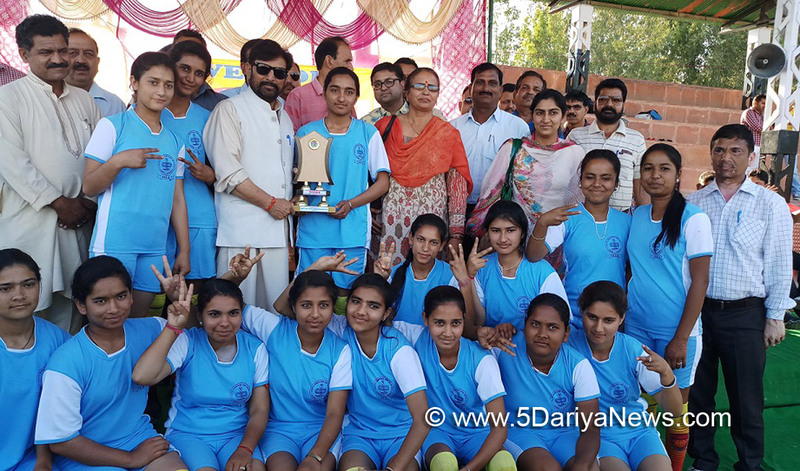 All the participating players were awarded with track suits by then Minister besides trophies were given to the winner and runner-up teams.Prominent among other present on the occasion were CEO Kathua, Nirmal Chaudhary, DySP Kathua, DFOs, ZPEO’s, Physical education teachers and masters besides students in large numbers.